The historic hilltop town of Montelparo has witnessed many things during her long lifetime; more than a few wars, an odd feuding baron or two the advent of electricity and of course, stunning views of the Marche landscape. But surely none perhaps more bewildering for the old girl than finding a young couple from England turning up one day as the proud new owners of a ruined palazzo at the top of the town, abandoned for over thirty years. 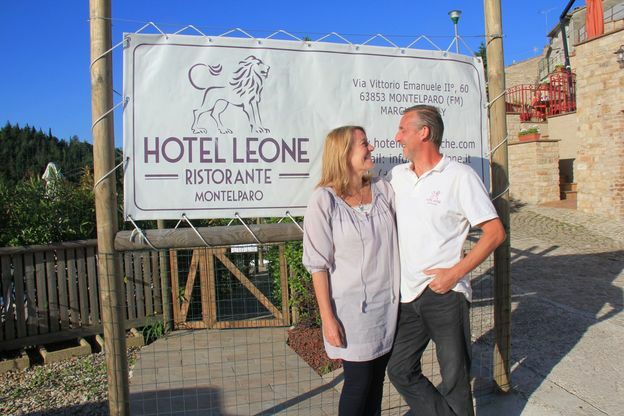 Three years later and after much personal toil and sweat, the old palazzo was alive once again, transformed into the stunning eight bedroom luxury boutique hotel and restaurant that is Hotel Leone.